Hanoi (VNS/VNA) - Vietnamese shares tumbled on August 9 on both local markets as investors triggered large-scale sell-offs following rising tensions between the US and the Democratic People’s Republic of Korea and false news about the arrest of a former banker. The benchmark VN Index on the HCM Stock Exchange plunged 2.26 percent to close at 773.66 points, extending its decline for a second session with total loss of 2.4 percent. The HNX Index on the Hanoi Stock Exchange dropped 1.19 percent to end at 101.07 points. The northern market index inched down 0.1 percent on August 8. The stock market turned chaotic when investors triggered large-scale sell-offs in all sectors with nearly 428.5 million shares being traded on both local bourses, worth 6.3 trillion VND (280 million USD). August 9’s trading figures were up 36 percent in volume and 29 percent in value compared to the previous session’s numbers. Among all 20 industries, the worst declining stocks were found in financial-banking, energy and real estate sectors. 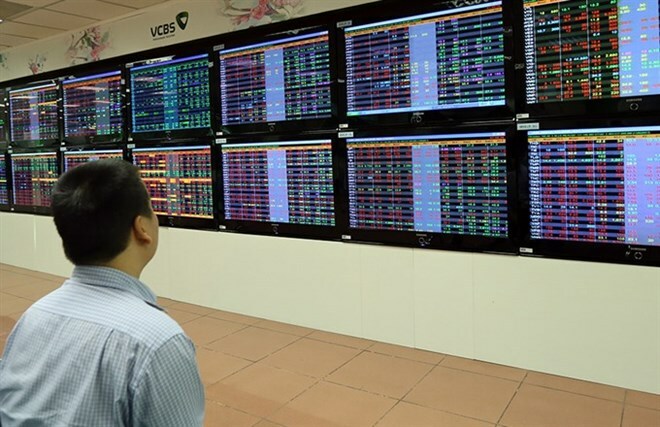 Vietnam’s stock market plunged on August 9 as investor confidence was pulled down by rising tension between the US and the Democratic People’s Republic of Korea threatening to conduct military action against each other, according to Bao Viet Securities Company (BVSC). Rising tension between the two countries caused investors around the globe to drop stocks and turn to safe havens such as gold. Vietnamese gold prices were up between 10,000 VND and 30,000 VND per tael on August 9 for both selling and buying orders while spot gold on the global markets moved up 0.4 percent to 1,265.18 USD an ounce. Foreign investors ended as net sellers after being net buyers for 14 consecutive sessions. They posted a net sell value of 16.9 billion VND, reversing from August 8’s net buy value of 123.5 billion VND. Vietnam’s stock market was also rocked by a market rumour that police arrested former chairman of the Bank for Investment and Development of Vietnam (BIDV), Tran Bac Ha. However, a public security official and Ha confirmed with local media that there was no arrest. BIDV shares, listed as BID on the HCM Stock Exchange, plummeted 6.8 percent, hitting its daily trading limit. As one of the largest lenders by market capitalisation, its fall was clearly among main reasons that the banking sector suffered a big loss on August 9. BVSC said in its daily report that the sharp decline on August 9 only reflected investors’ panic at a specific moment as the chance of a military conflict between the US and the Democratic People’s Republic of Korea is quite low while the arrest of the former banking executive was confirmed to be untrue to investors.